Flipper coil (solenoid) used in some Data East, Sega, and late-model Stern Pinball games. 23-gauge wire with 900 turns, 3.8 ohms resistance. 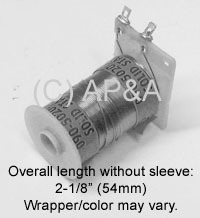 Includes coil sleeve. No diode across solder lugs.